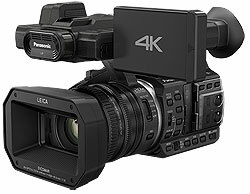 Panasonic HC-X1000, the world's first camcorder capable of recording 4K 60p/50p video images onto an SD card. The HC-X1000 records in 4K (3840 x 2160) and Cinema 4K (4096 x 2160) formats, offering four times the resolution of Full-HD, to produce smoothly flowing 60p/50p images. The new HCX1000 camcorder features a Leica Dicomar Lens, a new BSI Sensor, and the Crystal Engine Pro 4K. In addition, a 4-Drive Lens System allows the body to be compact while still housing a 20x optical zoom lens. This allows the HC-X1000 to deliver stunningly beautiful 4K images with real-life ambience and adds to the mobility of its compact dimensions. Versatile file formats - including AVCHD, MOV and MP4 - and high bit rates prepare the HC-X1000 for use in a wide range of applications. Triple Manual Rings, 2-Channel XLR Audio Input Terminals, ND Filters, and Dual SD Card Slots are among the many functions designed to meet professional demands. With the compact HC-X1000, 4K Ultra HD* video is created with a 4K 8-MP 1/2.3-inch BSI sensor. Compared with the 2-MP sensors used in ordinary Full-HD camcorders, this distinct sensor advantage renders UHD and FHD professional-quality results. Right down to the finest details, and with minimal blurring. *4K 3840 x 2160 and Cinema 4K 4096 x 2160. 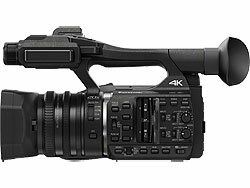 HC-X1000 highly agile, multi-format camcorder is ideal for shooting documentaries, sports and events. It supports 4K, Cinema 4K and Full-HD with frame rates that include 30p, 60p, and 24p. In 4K 60p resolution, the mobile HC-X1000 captures stunning, lifelike images. Using 60p/50p, the frame rate has twice the information of 30p for smoother motion. If you're ready for 4K, this is how you do it. 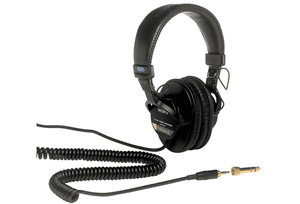 For external mic and line recording, the HC-X1000 is equipped with 2-channel input terminals. A +48 V phantom power supply is also included to handle pro-spec, high-performance microphones for recording high-quality sound. To fit a 20x optical zoom into this portable body, the HC-X1000 is designed with four compact, separately driven Leica Dicomar lens groups and a space-saving drive range. This efficiency - together with the subtle nuances and shading captured by renowned Leica lenses - clearly shows in sports scenes and other professional applications. In HC-X1000 suppress the amount of incident light, Neutral Density filters are built into the lens, and can be selected - 1/4, 1/16, 1/64 or OFF - to match your shooting environment. It's a distinct advantage when shooting at a slow shutter speed in bright daylight. And you can attain high resolution and a shallow depth of field when opening the aperture. For speedy and intuitive shooting, independent focus, zoom and iris rings are included on the lens barrel to meet professional needs. To make the shooting process smoother, an illuminating LED ring clearly verifies that recording is in progress. A feature easily turned on and off. For confident, comfortable recording in ultra-quality 4K, simply maintain the AF drive frequency at 60Hz to improve focus speed, stability and tracking performance. Shoot clear, detailed images even while observing wildlife in the dark (0 lux), taking advantage of infrared rays and IR-LED lighting. Remote Shooting - Remotely control and monitor the HC-X1000 in real time from your smart phone/tablet with the Panasonic Image App. One-Touch NFC Connection - Instantly sync your smart device to the HC-X1000 with a single touch. Versatile Recording Formats and Bit Rates - Versatile recording formats and bit rates prepare the HC-X1000 for use in a wide range of applications. The AVCHD recording format is joined by MOV and MP4 for quick and easy editing. Full-HD recording employs ALL-Intra compression for a maximum bit rate of 200 Mbps. High-Quality Full-HD Video Recording - Full-HD video recording is processed by a 4K 8 megapixel sensor. Compared to the 2 megapixel sensor used on conventional Full-HD camcorders, this renders high-quality images right down to the finest details, with minimal blurring. To ensure precise exposure adjustments, a graph indicates image brightness on the horizontal axis, and pixel volume on the vertical axis. When lighting or exposure adjustment is needed, excessively bright areas are marked with striped patterns in the viewfinder and LCD. Color Bar Monitor - Controls color accuracy. For editing reference, the bar can be included in the recording. To create natural coloring and delicate nuances, this function easily adjusts contrast, chroma level, exposure, sharpness and more. Displayed in a selectable color for easy manual focusing. Increases magnification up to 10x with a quick, multifunction dial control. Crop your composition and choose the perfect frame, plus zoom up to 200% while maintaining HD picture quality. More options include panning, tilting and stabilizing. Two SD card slots let you record to both cards simultaneously. When one card reaches capacity, recording is seamlessly switched to the other.